Book Lion Air flights & plane tickets on NusaTrip.com. Search any flight routes, compare prices with other airlines : Simple & Fast, 24/7 instant booking. Hybrid low cost airline (no free baggage for domestic flights, no food or entertainment). Find all Lion Air flights on all routes, get the cheapest fares in Indonesia, Malaysia, Singapore and Thailand when booking your Lion Air plane tickets, cheap, on NusaTrip.com online travel agent. Lion Air, a Lion Air Group company, is Indonesia’s largest privately run airline. Headquartered in Jakarta, Indonesia, Lion Air flies to cities within Indonesia, Singapore, Vietnam, Malaysia, Saudi Arabia. It operates scheduled passenger services on an extensive network from Jakarta to 79 destinations. Lion Air serves the highest number of airports within Indonesia. Lion Air Group also operate Wings Air, Batik Air, Malindo and Thai Lion air (all available on nusatrip.com). 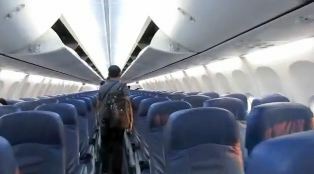 Economy Class: Lion Air Economy Class cabin is equipped with 29" leather seats. Free baggage 20kg for international flights only. No food or in flight entertainment are provided. Business Class: The Business Class service comes with exclusively designed leather seats with spacious leg room of up to 38". In- flight dining includes a world-class cuisine and Indonesian signature dishes. Free baggage allowance of 30 kg for international flights. Business class is not available on all route or flights. No in flight entertainment. Cabin: Passengers are permitted one (1) piece of cabin baggage, which must have a maximum length 40 cm, width 30 cm, and depth 20 cm; however, the sum of the three dimensions shall not exceed 115 cm (45 in.) or weight of 7 kg. Note: Special regulations apply for the transportation of fragile, bulky, valuable, and diplomatic baggage in the passenger cabin. Check-in: Baggage allowance for international flights; Business class 30Kg, Economy class 20Kg. Surf boards, bicycle, and sport equipments will be charged according to the weight carried. Effective January 8th 2019: Lion Air and Wings Air are no longer giving free baggage allowance for all domestic flights. Prepaid Baggage can be purchased no later than 6 hours before departure time. International Flights: Check in is usually from 2.5 hours prior to departure time. Check-in counters will be closed 45 minutes before departure time. Indonesian Domestic Flights: Check in usually starts 90 minutes before the departure time. Check-in counters will be closed 45 minutes before departure time. Terminal 1A : Domestic flights to destinations within Java Island, Celebes Island, Borneo Island, Ambon Island and Papua destinations. Terminal 1B : Domestic flights to destinations within Sumatra Island, Bali Island and Lombok Island. Terminal 2E : International flights. Lion Air reserves the right not to carry infants under the age of 7 days. Babies between the ages of 3 to 7 days must have a medical certificate which states that the baby can travel by plane. The medical certificate shall be issued not more than 72 (seventy two) hours before the flight. Ticket price not including food on board. For Business Class passenger who travel for long distance, the fare price includes food. Ticket refund and exchanges are permitted with payment of fee and fare difference (if any), and within a defined deadline. Change and upgrade will be charged with fee USD 20/SGD 30/MYR 75/IDR 200000 per-passenger (subject to change). Name changed is not permitted in this case.